The show airing March 26, 2018 – April 2, 2018 ‘highlights’ the Fix’Em Clinic. We interviewed Lisa Mitchell, Director, Fix’Em Clinic. She discussed their recent opening and the purpose of the clinic. Their goal is to minimize the euthanasia and suffering of thousands of animals in our region and strive for a time when every companion animal has a loving home. A humane, sustainable solution is to prevent the births of unwanted litters through spay/neuter. To substantially impact the population you must spay and neuter a LOT of dogs and cats and people must be able to afford your fees. They will accomplish this at the Fix’Em Clinic by spaying and neutering around 7,000 dogs and cats every year at a cost substantially lower than the average fee in our area. This clinic model is called a High-Quality, High-Volume, Affordable Spay/Neuter clinic. The clinic recently opened on February 19th. Click here to review their services. Lisa also invited everyone to the clinic on April 5, 2018 from 6-8:00 p.m. One of their advocates, Jim Strawn, is turning 21,000 days old. He is having a 21KBirthDay with Fix’Em Clinic as the beneficiary. Jim asks that you bring $10 or an item from the clinic’s wish list. If unable to attend the event, Jim has set up a web site to donate $10 (or more) to the clinic on his behalf. Click here to go to the 21KBirthDay site. 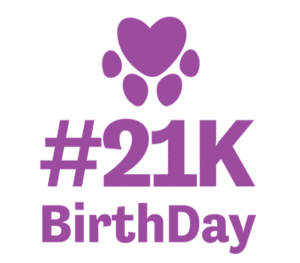 When sharing the site or info about the event, use #21KBirthDay. To learn more about the clinic, call 866-FIX-EMWV (866) 349-3698.